the refreshment of the Spirit"
The Canticle Singers (“TCS”) proudly presents Voci Vivace (or “lively voices” in Italian), an eclectic collection of songs from the world of opera, musicals, pop, spirituals, jazz and more and celebrate the songs and music of Alan Menken, Billy Joel, Bill Withers, Cole Porter, Frederick Loewe, George Gershwin, Gioachino Rossini, Greg Gilpin, Johann Sebastian Bach, John Lennon, Lionel Bart, Patrick Leong, Richard Rodgers, Stephen Sondheim, Wolfgang Amadeus Mozart and others. Immerse yourself with ‘Go the Distance’ from "Hercules", ‘Ce'st Moi’ from "Camelot", ‘Lean On Me’ from the album "Still Bill”, ‘Nothing There to Love’ from "Amazing Grace the Musical", ‘Let It Be’ the Beatles release, ‘A Celebration of Company’ from "Company", ‘Donne Mie La Fate A Tanti’ from "Cosi Fan Tutte", ‘Ikaw’ and more. The concert is in support of Purple Centres Foundation, Manila. The run time is approximately 100 minutes exclusive of a 15 minute intermission. WAZE will lead you to Luther Lead Centre. There is limited elevator access from the basement up to the auditorium. Members of the audience are requested to be seated by 8.15pm. The minimum age for admission with a ticket is 10 years old. Latecomers will be admitted during a convenient break in the program. No photographs, video or sound recordings may be taken during any part of the concert. No food or drinks are allowed in the auditorium. The auditorium is a no smoking facility. - Members of the audience are requested to be seated by 8.15pm. - The minimum age for admission with a ticket is 10 years old. - Latecomers will be admitted during a convenient break in the program. - No photographs, video or sound recordings may be taken during any part of the concert. - No food or drinks are allowed in the auditorium. - The auditorium is a no smoking facility. - There is limited elevator access from the basement up to the auditorium. - Additional and ample parking, on a paid basis is available at Solaris, Mont Kiara about 5 minutes away. - Tickets once sold are "non-refundable". 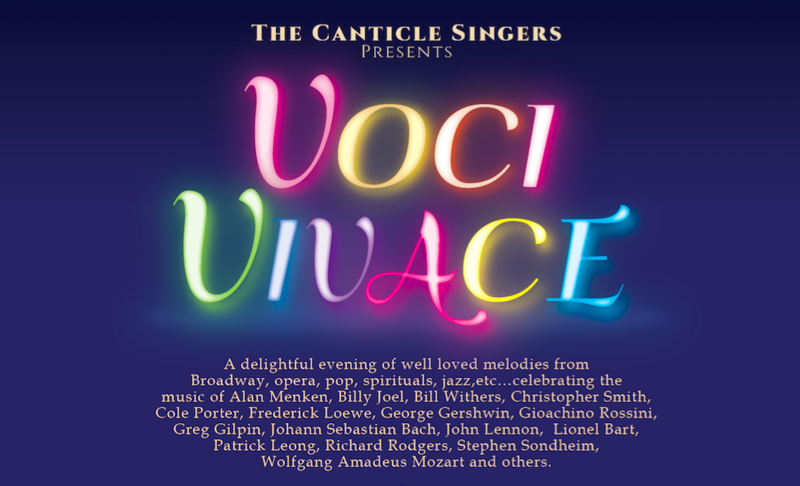 Voci Vivace will feature The Concert Chorale of 18 voices and guest artists Ang Mei Foong, Soprano; Cipriano De Guzman Jr, Baritone; Patrick Leong, Tenor and Gospel recording artist and Crimson Guirjem from Philippine Ballet Theatre. Mark Anthony Carpio, Choirmaster of the world acclaimed Philippine Madrigal Singers will guest conduct the choral piece “Ikaw” at the Sunday 7 October 2018 performance. Timothy Ooi will be your concert host with Alice Ang Ying Ying as the accompanist. The concert will also feature a special needs guest Joel Lau who has Asperger Syndrome, currently studying F&B at Berjaya College, will be joining the chorale a number. TCS is an accomplished voluntary chorale (choir) established in Kuala Lumpur in 1992 and celebrated its 25th Anniversary in 2017. We embrace a repertoire of choral music which entertain as well as seek to inspire, encourage, provide hope and share our thoughts. Our music encompasses a wide repertoire of musicals, pop, folk, jazz, lounge, semi-classical and classical music. TCS comprises volunteer singers from all walks of life and different occupations and backgrounds. All our singers are volunteers and unpaid. Our members are offered opportunities to improve and advance their performing skills, encourage a keener appreciation of music and the performing arts; contributing to the creation of a more artistically sensitive and vibrant community. TCS has done 26 productions to date and possibly offers one of the most extensive concert repertoires in the country. Our larger productions have been done as benefit concerts for a range of charities, non-governmental organisations and other worthy causes, touching lives in Malaysia, Indonesia, Thailand, Sri Lanka, Pakistan and Philippines. TCS was awarded The Boh Cameronian Arts Award for Best Group Vocals in 2014 and 2011 and won 6 nominations for the same award in 2014, 2012 and 2011. Copyright © 2019 The Canticle Singers. All Rights Reserved.